While the Portuguese capital offers more than enough to keep visitors entertained, venturing even a little outside it brings rich rewards. From secret tunnels to raging surf, fishing villages to Roman ruins and more, these are some of the best day trips you can take from Lisbon. All of these destinations can be easily reached by public transport within 90 minutes, thanks to an efficient, inexpensive bus and train network. Renting a car gives extra comfort and flexibility. Undoubtedly the most popular day trip from Lisbon, Sintra’s UNESCO World Heritage status is well-deserved. While the most popular attraction is the Palácio de Pena, a former summer palace for the royal family, there’s much more to Sintra and its surroundings than that. Both the Palácio Nacional de Sintra and Castelo dos Mouros are impressive in their own right, with sweeping views and fewer visitors than the bustling Pena Palace. Quinta da Regaleira is a must-visit. This eclectic palace and gardens sit on the edge of town, crammed full of Masonic symbols, lakes, waterfalls, secret tunnels and more. In the hills above, the Convento dos Capuchos is a stark contrast, the former home of Franciscan monks who avoided all creature comforts. Trails cross the forests and mountains surrounding the town, and hiking up to the hilltop palaces is a peaceful alternative to the taxis and tuk-tuks offering rides. It’s also not far to Cabo da Roca, the westernmost point in Europe. If you can, try to visit the lighthouse there at the end of the day to take in the sunsets. Suburban trains run to and from downtown Lisbon all day, or it’s a half-hour drive along the A37 motorway. Visiting on mid-week mornings helps avoid the worst of the crowds. If you’re looking for a beach break, check out the former fishing village of Cascais. It’s transformed into a vacation spot for Lisbon locals and international visitors alike in recent years, so can get busy. Don’t expect much space to yourself on the main beaches during summer weekends! Fortunately, it’s easy to take a taxi to quieter patches of sand like Praia do Guincho further along the coast if things get too crowded. You can also rent city bikes for free (with ID) to explore the coastline via a dedicated cycle path. Once you’ve tired of the sunshine, Cascais has plenty of excellent seafood and other restaurants, as well as souvenir shopping options that differ from those in the capital. Fishermen still mend nets and sell their catch in the harbor, and the town retains its laid-back vibe, especially outside the summer peak. Cascais sits at the end of one of the suburban train lines, with services from Cais do Sodré every 20-30 minutes throughout the day. It’s also an easy half-hour drive from Lisbon along the N6 or A5, although parking can be a challenge. 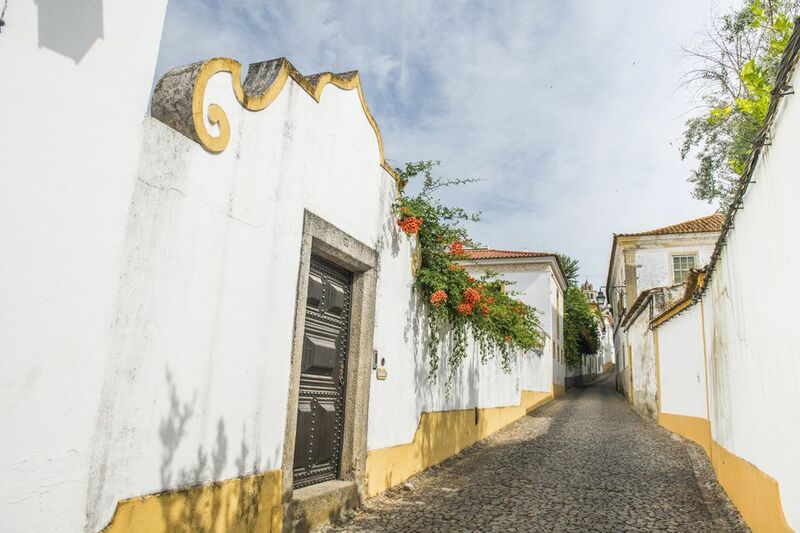 Around an hour and a half from Lisbon by bus or train, Évora is a historical and gastronomic delight. The town dates back to Celtic times, but it was the Romans and later rulers who left the most visible marks. The remains of the Templo romano de Évora is the most famous attraction, standing on a raised platform in one of the town squares. A section of the original city wall also still remains intact in the current city center and the towering arches of a medieval aqueduct stretch from the downtown area for nearly six miles through the countryside. A signposted walking path runs alongside or near the aqueduct and is an ideal way to see a little of rural Portugal. Attached to the bright-white Igreja de São Francisco, a church worth seeing in its own right, is the macabre Capela dos Ossos. Literally the ‘chapel of bones,’ this small chapel is covered from floor to ceiling with thousands of bones exhumed from local cemeteries. The city’s cathedral is also worth the visit, particularly for the rooftop views of Évora and its surrounds. Once the sightseeing is done, it’s time to enjoy the food and wine that make the Alentejo region famous. There are plenty of open-air restaurants in and around the main square, serving regional dishes like black pork and mussels. For more variety, however, follow your nose through the narrow residential streets a few minutes away. Many houses have been converted into small restaurants, with top-quality dishes at very reasonable prices. Given the travel time and midday heat, it’s best to leave Lisbon early in the day and return in the late evening. This allows a few hours of sightseeing either side of the extended (1-3pm) lunch break when most attractions are closed. Nazaré is regularly home to some of the biggest waves on the planet. A record may have been set there in 2013, and when conditions are right, top surfers from around the world descend on this small town. You’ll get a great view of the action from beside the lighthouse at the top of the cliffs, although be prepared for strong winds when you’re up there. If you’d prefer less of a gale, watch from the adjacent Praia do Norte (North Beach) instead. Praia de Nazaré offers a much calmer beach experience, with sun umbrellas and paddling in the ocean replacing the pounding surf. There’s a funicular joining the beach and the clifftop area of O Sítio, if you don’t fancy climbing up and down the cobbled path. The town is a popular vacation spot but retains many of its traditions. Locals often wear handmade, patchwork skirts and trousers, and many of the town’s fishing boats are in an ancient Phoenician style, including painted eyes on the bow. It’s also a great place to try some of Portugal’s seafood dishes, including its rightly-famous sardines. Buses run regularly from Sete Rios station, taking around two hours. If you’re driving, expect to cover the 80-mile distance in about ninety minutes.